Marc-André Lemire stood at the counter of a Canadian Tire store in Montreal, with a fist full of multi-coloured money he’d just received from the cashier. He flipped through the wad and stopped abruptly when he came across a $2 bill. It had been issued in 1992, and it took a matter of seconds for Lemire to realize the note was worth thousands of dollars. The serial number on the back of the Canadian Tire coupon is what made it special—the amount of space between each of the 10 digits was a few millimetres less than on a standard bill. Lemire tucked it into a plastic sleeve, and called a friend to crow about his find. Many people remember a time when they came across Sandy McTire’s face smiling from a stash in their grandmother’s kitchen cupboard. But for some, Canadian Tire money has far greater worth than its face value. A 50-cent note issued in 1958 is now worth upwards of $1,500; this month, an anomalous $2 bill from 1989 went up for auction with a reserve price of $3,000. At least 250 people across the country, however, know full-well. 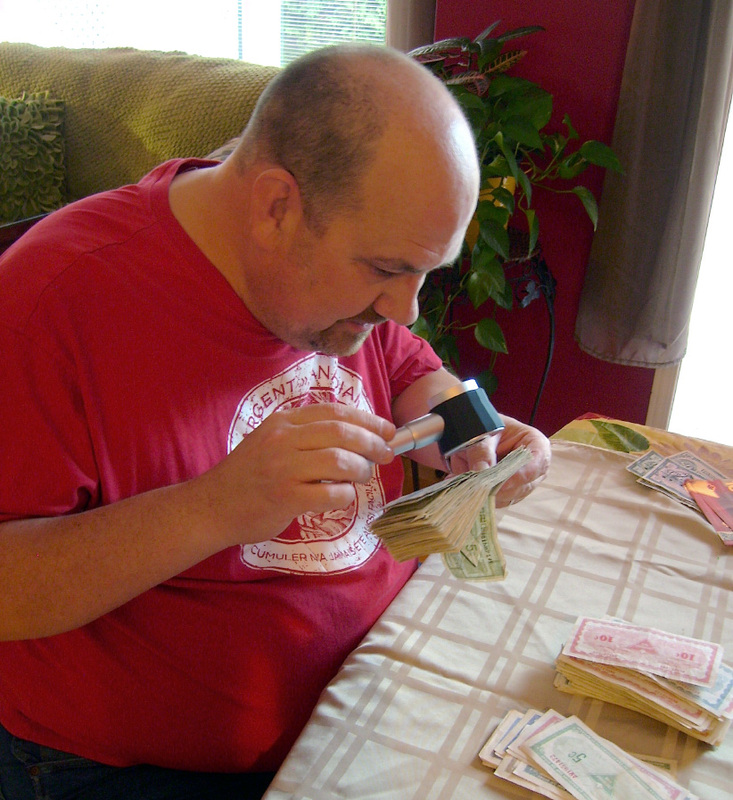 Members of the Canadian Tire Coupon Collector’s Club have been cataloguing, preserving and trading Canadian Tire money since 1990, compiling a list they believe includes every coupon ever found. The store chain is not directly affiliated with them, but has rights to the organization’s name, and says it appreciates the group’s ongoing loyalty and support. Like most people, I had no idea this club existed until my aunt married Lemire a decade ago. Today, my uncle estimates he has 1,000 bills in his core collection, and another 5,000 that he keeps to trade. The idea of Canadian Tire money was proposed by Muriel Billes—wife of the corporation’s co-founder A.J. Billes—when the company opened its first gas bar in 1958. She figured that, rather than advertise low gas prices, Canadian Tire should entice customers to return and buy merchandise from the store. Initially called coupons (hence the name Coupon Collector’s Club), the company eventually began calling it Canadian Tire “money.” It’s now Canada’s oldest loyalty program. As with legal tender, it takes an old, rare or anomalous bill to attract collectors. Replacement notes—issued to replace a series of bills damaged during printing—draw interest. Mismatched serial numbers (the number is printed twice on the back on each bill) or slight alterations to Sandy McTire’s appearance also add value. Some collectors look for what they call “highs and lows”—the highest and lowest serial number for every bill ever printed. To share their stories, members hold a dozen or so meetings across the country each year, plus an annual weekend-long swap meet. Their gatherings typically include show-and-tell time, as well as an “educational presentation” where members are briefed on a specific topic (the theme of one recent meeting: new replacement notes). The marketplace is changing, however. Three years ago, the company launched a digital loyalty program, where money is stored on a card or a smartphone app after every purchase. The back of the loyalty cards boast “there’s no paper Canadian Tire money to store”—words to fill a coupon collector with dread. While Canadian Tire says it recognizes the passion for its money, and will continue to print it, collectors aren’t so sure. Lemire used to visit 13 Quebec stores a week to load up on bills; he only bothers visiting about three now, because he’s noticed there are fewer notes in circulation. While dwindling numbers of bills could make those available more valuable, Lemire fears demand will fade because younger generations aren’t familiar with Canadian Tire money, and won’t collect it.